MUMBAI: Casio India Co. Pvt. Ltd, a leading manufacturer of electronic musical instruments, has launched its brand-new CT-X series of portable keyboards. The launch of this Series marks a historic moment in Casio’s tradition of introducing new products based on real-world feedback from Indian customers in order to grow the market. 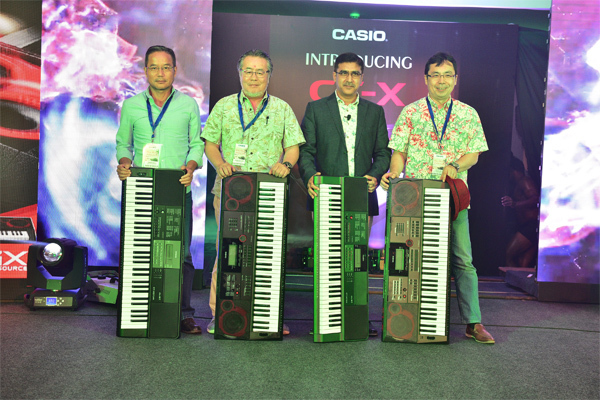 "The CT-X series represents an unprecedented level of sound quality for Casio which is a direct result of the new AiX processor," said Kulbhushan Seth, Vice President of Casio India Co. Pvt. Ltd. "We at Casio India have always worked towards developing the market and following our philosophy of creativity and contribution, strive towards developing such great products with high quality features which further expand the market. The economical pricing of the CT-X series is bound to help high grade students and performers, in making the right keyboards for their needs affordable." · Indian Folk and Regional Keyboard players using the keyboard for performances in Jagrans, Bhajans, Kathas/Kirtans, Festival performances, Bollywood/Entertainment Performances. · Academic learning in schools and institutions, musical examinations (all musical grade examinations). · Keyboard players looking for western tones and performance oriented keyboards. The CT-X series provides high-performance Digital Signal Processor (DSP) effects that combine various algorithms to realize the perfect effect for each instrument sound. The CT-X700 and CT-X870IN's stunning instrument tones are perfect for beginners or advanced players that need an affordable and portable instrument while the CT-X8000IN and CT-X9000IN provide additional rhythms, tones, DSP editing features, USB drive for music playback, phrase pads, expression pedal inputs as well as more powerful speaker systems suitable for all grade music examination and powerful performance. The CT-X8000IN has a 6W+6W speaker system and the CT-X9000IN has an incredible 15W+15W high-output amplifier delivering powerful sound output for rehearsal or performance applications. · AiX Sound Source Reproduces the Natural Sound of Acoustic Instruments The keyboards provide high-quality tones across every category of instrument, faithfully reproducing subtle nuances and gestures specific to each type of sound. The user can customize tones to taste using 100 DSP effects that combine various algorithms, three system effects (reverb, chorus, and delay) and 10 equalizer presents. · Wide Range of Tones and Rhythm Patterns Support Diverse Musical Genres. An extensive library of 800 tones and 250 rhythms supports diverse musical genres, and applications from composition, to arranging, to live performance. The keyboards contain 43 Indian Tones and 39 Indian Rhythms for diverse regional musical applications. · New Speaker System Delivers Powerful Sound. The keyboards feature large-magnet bass reflex speakers and a 15W+15W high-output amplifier (maximum output of CT-X9000IN model) to deliver powerful sounds for home or performance use. · Registration Function for Instant Recall of Performance Setups. The Registration function enables the user to save up to 128 keyboard setups including tones and rhythms. The user can instantly switch between complex playing patterns and tone/rhythm setups without configuring them every time, enabling versatile and seamless performance. · Composing and Arranging Features Help Bring Ideas to Life. In addition to configuring and saving tones and rhythms to suit the user, the keyboards provide a variety of features for composing and arranging. The Phrase Recorder allows users to record a musical phrase that can be instantly triggered using any of the four pads. The mixer can handle 42 different parts and the 17-track MIDI sequencer can save up to 10 original songs. · Accessory Jacks and Ports for Performing, Composing, and Arranging. An assignable jack can be used with either a footswitch or expression pedal. Also provided are an audio input jack for connecting external audio equipment, and a class-compliant USB port for connecting to a computer. An additional USB port supports memory devices to easily save and load data created on the CT-X9000IN/X8000IN. · Friendly User Interface Offers a Wide Range of Applications. The keyboards provide an expanded Registration function and four phrase pads, together with direct access buttons for Tap Tempo, Transpose, and Octave switching making the keyboards suitable for stage and live performances, as well as music schools and music classrooms. · Sophisticated Styling Matches the Advanced Specifications. The powerful speakers are embellished with distinctive red highlights, giving the keyboards a stylish, iconic look. The CT-X9000IN is distinguished by a grey metallic finish that adds to the sophisticated styling. · AiX Sound Source Reproduces the Appealing Sound of Acoustic Instruments. The keyboards provide high-quality tones across every category of instrument, faithfully reproducing subtle nuances and gestures specific to each type of sound. · Wide Range of Tones and Rhythm Patterns Supports Diverse Musical Genres. An extensive library of 600 tones and 195 rhythms supports diverse musical genres, and applications from composition, to arranging, to live performance. The keyboards contain 21 Indian Tones and 26 Indian Rhythms for diverse regional musical applications. · Registration Function for Instant Recall of Performance Setups. The Registration function enables the user to save up to 32 keyboard setups including tones and rhythms. The user can instantly switch between complex playing patterns and tone/rhythm setups without configuring them every time, enabling versatile and seamless performance. · Accessory Jacks, Ports and Functions for Performing, Composing, and Arranging. The CT-X870IN/X700 keyboards provide a port for a sustain pedal, an audio input jack for connecting external audio equipment, and a USB port for connecting to a computer. In addition, the CT-X870IN features an additional USB port which supports memory devices, plus a Pitch Bend Wheel for recreating various instrument gestures. The keyboards also come with a 6-track MIDI sequencer with room for up to five original songs. A proprietary technology developed by LeEco, CDLA stands for Continual Digital Lossless Audio. MUMBAI: NUGEN Audio today announced that its Korean distributor, Music Metro, will represent the company at the KOBA 2016 show, May 24-27 at the COEX convention and exhibition center in Seoul, South Korea. MUMBAI: Portronics has launched a new elegant portable speaker called Sound Wallet. The swanky portable speaker is small enough to fit the palm of your hand. MUMBAI: With cushioned headgear and an adjustable band, Kidwavz KV-100 Bluetooth Headphones rolled out a brand new pair of headphones, designed for children between the age group of four and 14 years. Beats by Dr. Dre unveils the new Beats Pill+ bluetooth wireless speaker with added features that promises to deliver a premium audio quality and has a battery that can sustain for 12 hours.